Huge Crowd In El Salvador For Beatification Of Slain Archbishop : The Two-Way The ceremony for Oscar Romero — who was gunned down during Mass in the capital, San Salvador, in 1980 — is the last step before being declared a saint by the Vatican. A man holds an image of late Archbishop of San Salvador Oscar Arnulfo Romero during his beatification ceremony Saturday at El Salvador del Mundo square in San Salvador. 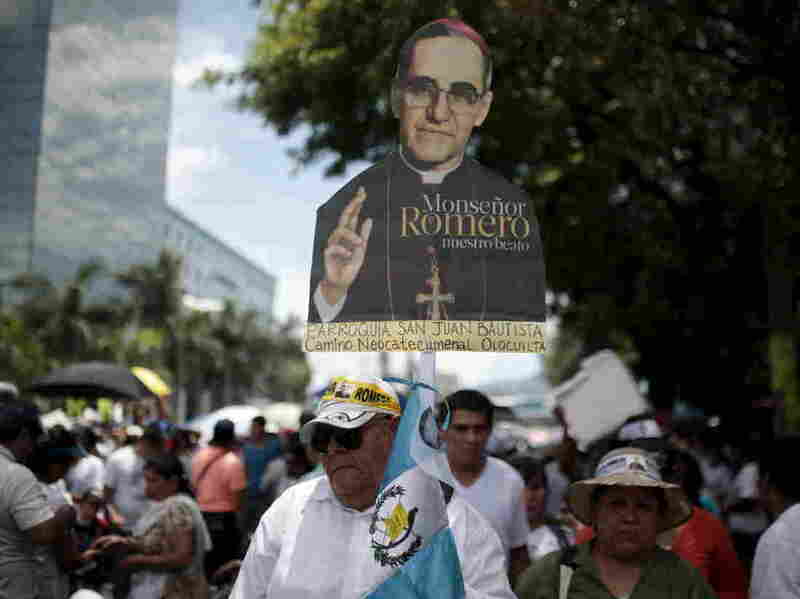 Oscar Romero, the Catholic archbishop who was murdered in El Salvador in 1980 by a member of a right-wing death squad, has been beatified in a ceremony in the country's capital Saturday that drew at least a quarter of a million people. The beatification is the last step before canonization, when the Vatican would declare Romero a saint. In January, the Holy See declared him a martyr. Romero was archbishop of San Salvador at the start of El Salvador's 1979-1992 civil war. He was gunned down while celebrating Mass in March 1980 after denouncing a crackdown on leftist opponents of the country's military government. As NPR's Carrie Kahn reported on Friday from San Salvador, Saturday's beatification ceremony "ends a long-fought battle for recognition of Romero's life and work. But many say it does little to curb the current gang violence terrorizing the country today." According to Carrie, "Romero's beatification has brought visitors and his supporters from around the world to this small Central American nation. They stream through Romero's spartan home in San Salvador, the capital, now preserved as a tiny museum, where Romero lived up until his death." In a letter to the current Archbishop of San Salvador, Pope Francis said Romero's beatification created "a favorable moment for true and proper reconciliation. "In this day of joy for El Salvador and also for other Latin American countries, we thank God for giving the martyr archbishop the ability to see and feel the suffering of his people," the pope wrote, according to the BBC.